In Beach Blanket Bingo, aside from the Rat Fink gear, you can see people (including my beloved Bonehead) sporting tops featuring a big-nosed character carrying a surfboard. I was able to make out the label Hot Curl and found out that this guy also carries a bit of a history. "In 1963, Mike Dormer and Lee Teacher built a six foot, 400 pound concrete statue out of cement, iron, a mop, a light bulb, and a beer can. They dubbed their creation "Hot Curl". The statue mysteriously appeared on the rocks over Windnsea beach in La Jolla, holding a beer in one hand while gazing out over the ocean in search of the perfect wave" (Taken from MichaelDormer.com). The City of San Diego wanted it removed, claiming it was dangerous among various other reasons. 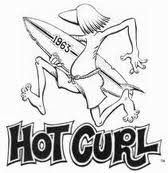 Apparently some of the surfing locals staged a 'Save Hot Curl' protest which attracted nationwide attention. The 1964 clipping below was found in an online edition of Feb/Mar Ocean magazine 2010 in which the artist, Michael Dormer speaks about the incident. You can read more here. Hot Curl went on to feature in the 1964 movie, Muscle Beach Party as well as appearing in subsequent title, Beach Blanket Bingo (which I posted about here) where I first came across the character on Bonehead's shirt. 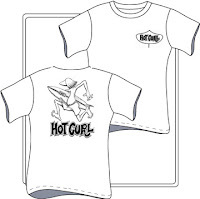 You can catch many glimpses of Hot Curl as various dancing teenagers parade on the screen wearing the character on the back of their tops. 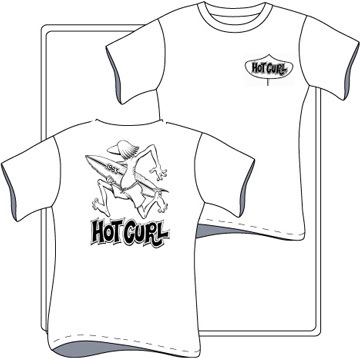 You can still get a similar shirt today from the official site -Hot Curl Lives. The Boxart Den has pictures of Hot Curl models (note the female version, Curl's Gurl, on the far left) as well as other surfing related models including creations by Ed 'Big Daddy' Roth who I posted about here. Hot Curl still appears today in Surfer magazine. You can probably see I'm finding the 60s surfing culture fascinating. La Jolla, wow, that's local to me as well. Err, well, a couple hours away, but close enough. Man, that is so cool! I love renegade artists! Thanks for such an informative post! I live in Socal and have never heard of Hot Curl! I'm so clueless, I thought you were going to be talking about old-school hot rollers. This is so cool though :) I need to rent some of those beach movies. Ally - ha ha See what I did there? ;) I've enjoyed watching these movies - they're not award winning but they're silly and fun with lots of cool things to look at. I love how you've researched all this Rat Fink stuff from the beach party movies. I've watched the Frankie and Annette movies countless times, but I've never noticed all the little details that you've noticed. I'll have to start paying more attention. Thanks Jennie. Only problem is I've found even more stuff that I simply HAVE to have which is virtually impossible because they're so rare.